HAVE YOU BEEN ON THE SPIRITUAL PATH FOR A WHILE NOW AND FIND YOUR HEART WANTING MORE THAN “CHANGE YOUR THINKING, CHANGE YOUR LIFE”? YOU LOVE LEARNING THAT YOU ARE ONE WITH THE INFINITE, BUT WHAT DOES THAT REALLY MEAN? ARE YOU CURIOUS ABOUT THE VIOLET FLAME AND HOW TO USE IT? WHO ARE THE ASCENDED MASTERS ANYWAY AND WHAT DO THEY HAVE TO DO WITH ME? DO YOU HAVE A SENSE OF LONGING TO GO HOME AND WONDER HOW YOU FIT INTO THE WHOLE SCHEME OF GOD? YOU ARE A MYSTIC AND THAT CALLING IN YOUR BELLY FOR MORE … IS REAL. THAT’S WHY I CREATED THE COMPANY OF HEAVEN AND YOU! A PRACTICAL FOUNDATIONAL CLASS ON THE HIERARCHY OF HEAVEN AND YOUR PLACE IN IT. How do you cooperate with the Divine and all of It’s helpers so you can experience and manifest the Kingdom of Heaven while living on Earth? This powerful class is our foundation class for the Ascension Academy. In this class you will not only learn how to cooperate with the Divine, you will start to feel so grounded in your life that you’ll know you’re connected to what you came here to do and feel empowered to do so. You’ll start to feel completely supported and loved from the inside out. As you learn about the Company of Heaven you will fully realize they are in love with you, just as you are. As you align with the Hierarchy of Heaven your life not only becomes easier, but filled with Freedom and Fulfillment. As a part of your tuition you will receive a bonus Mystical Journey Session with Jennifer (a $200 value). 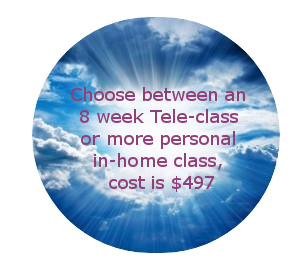 Each class will be recorded, so that you can keep the deep meditations from this class to use over and over again. And you will. You will also be purchasing your own text book, 21 Essential Lessons Volume I by Werner Schroeder. You presented the material with great reverence and passion. you bring life to the work, make the teachings real and immediate. i will be part of the next class and look forward to it. Oh Wise One! This class has been brilliant. I’ve loved every part of it!. The class has been beautiful and I am going to miss it deeply. You guide the most wonderful meditations and those Monday nights I had the most blissful dreams and restful sleep. I felt profoundly connected to the teachings you introduced, which are now part of my daily life…I have now a much deeper and strong connection with my beloved I AM Presence.